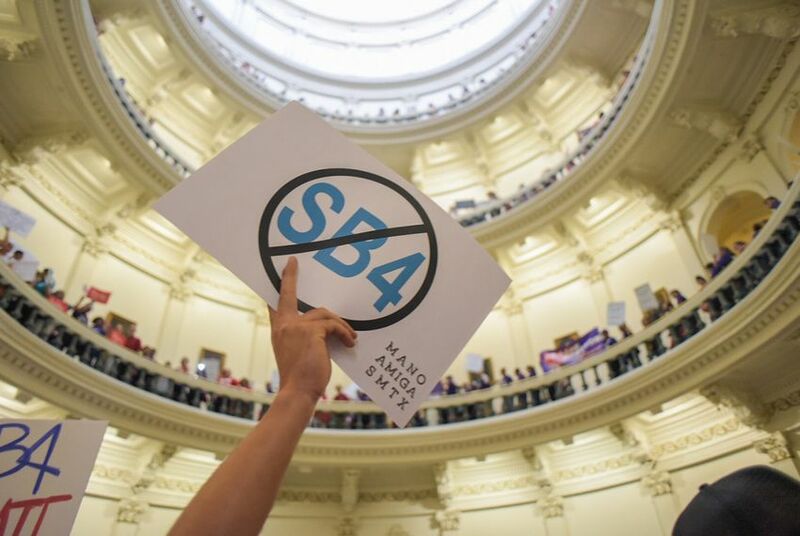 For the second time this week, the Texas attorney general's office sparred in federal court with opponents of the state's new immigration-enforcement law, Senate Bill 4. Both sides got an earful from federal Judge Sam Sparks. The law bans “sanctuary cities,” the common term for local governments that do not enforce federal immigration laws. It will take effect Sept. 1 unless a court intervenes. The attorney general’s office sued Travis County and Austin officials shortly after Gov. Greg Abbott signed the bill last month, seeking a ruling that the bill is constitutional. But opponents of the measure, including the cities of Houston, Austin, San Antonio and El Cenizo, as well as Maverick and El Paso counties, have argued the law violates several provisions of the U.S. Constitution and filed a separate lawsuit against Abbott and Attorney General Ken Paxton in San Antonio, trying to prevent the law from taking effect. The state wants that case moved to Austin, arguing it's the proper venue because it's where the governor and attorney general live. The law allows local law enforcement officers to question the immigration status of people they detain or arrest and punishes local government department heads and elected officials who don’t cooperate with federal immigration "detainers" — requests by agents to turn over immigrants subject to possible deportation. “The city of Austin just got in because it's political and they get a lot of advertisement” in the press, he said. Sparks later invited both sides to sit and observe his courtroom on a day when he takes up immigration cases so they could observe the side of the issue that 99 percent of the public doesn’t see. “I don’t have the authority to forecast the future, and you have a statute that doesn’t come into effect until September,” he told David Hacker, a lawyer for the attorney general’s office. Sparks didn’t give a timeline on when he’d rule on the motion to move the case to Austin.